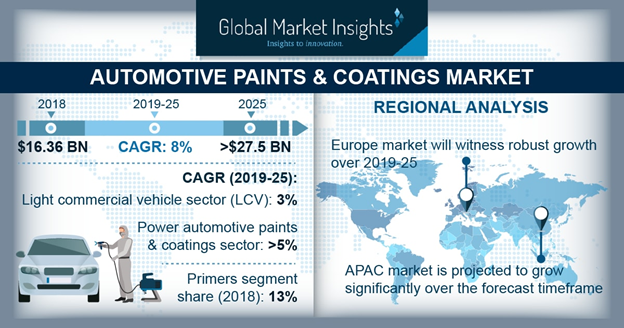 Automotive Paints and Coatings Market size is estimated to reach USD 27.5 million by 2025; according to a new research report by Global Market Insights, Inc. Rising vehicle production coupled with rising consumer preference towards dual color alternatives are driving the automotive paints and coatings market share. Industry players are investing in technologies and finishes to give customers alternatives for customizing their vehicles. Additionally, scratch resistance along with improved gloss finishing and corrosion resistance are gaining significant traction in the market. Growing customer expectations primarily with respect to sustainability, durability and aesthetics of vehicles are enabling automobile OEMs to develop new color combinations and solutions. Paint manufacturers are collaborating with automobile OEMs to reduce toxic substances in paints. The development of water-borne products with reduced volatile organic compounds (VOC) emission eliminates the toxic gas emission during painting, thereby promoting worker safety. The development of such paints also contributes towards reducing the problems associated with waste disposal owing to the reduced usage of hazardous substances, thereby expanding the automotive paints and coatings market size. Industry participants are collaborating and continuously investing in R&D for developing advanced paint technologies for increasing the market share. For instance, in 2018, BASF entered into a joint venture with Sirrus for developing high performance automotive coatings based on the methylene malonate technology. These coatings contribute significantly towards lowering emissions and offer smooth finish in vehicles. Technological advancements in paint technologies play a major role in expanding the automotive paints and coatings market size over the projected timeframe. Proliferation of low temperature paint systems enables for superior paint finishes at around 100 degrees compared to around 150 degrees in the traditional paint systems. Additionally, the technology also maintains the color uniformity between various car body parts and offers automobile manufacturers to increase their base coats. For instance, in 2018, Ferrari introduced a low bake paint technology, that enabled the company to produce over 61 different base coat colors. Light commercial vehicle (LCV) automotive paints and coatings market share will witness around 3% CAGR owing to increasing sales of light commercial vehicles across the globe. For instance, according to the International Organization of Motor Vehicle Manufacturers (OICA) production of LCV in 2018 was 21,072,296 units accounting for an increase of around 4.2% as compared to 2017. The paint manufacturers are expanding their global presence by opening new facilities in several regions for catering to a rapidly growing LCV paint demand. For instance, in March 2019, BASF opened a new facility in China for producing its LCV paint solutions including ColorECo. Primer coating will account for a significant share in the automotive paints and coatings market. This can be attributed to the superior corrosion and scratch protection offered by primers. Additionally, these coatings also offer significant UV ray protection along with enhanced protection against stone chipping. Moreover, the development of advanced primers with the capability of applying in stainless steel, cold rolled steel, aluminum, and fiber glass further accelerates the segment share over the projected timeframe. The growth in the waterborne automotive paints and coatings market share can be credited to the stringent rules and regulations pertaining to the reduction of VOCs in automotive paints and coatings. Additionally, the presence of minimum toxic materials along with lower flammability compared to solvent based paints further expands the segment size. Additionally, higher gloss polish along with durable finishing over long period further expands the segment growth from 2019 to 2025. Growing demand for metallic texture paints owing to unique gloss finishing are supporting the segment share over the study timeframe. The improved aesthetics offered by these paints along with superior finishing along with the capabilities to hide scratches easily are providing a positive outlook for the automotive paints and coatings market expansion. OEM is expected to hold dominance in automotive paints and coatings market size over the study timeframe. The dominance can be attributed to rising vehicle demand across the globe. Industry participants are collaboratively working with automotive manufacturers to minimize energy consumption and CO2 emission from paint application activities. For instance, in 2017, Audi, BASF, and Covestro entered into a strategic partnership to develop bio-based hardener for Audi Q2. These paints offer superior glossy finishes to the vehicle along with minimizing CO2 emissions significantly. Polyurethanes accounted for considerable share in the automotive paints and coatings market. Polyurethanes materials are widely used in paints owing the benefits offered including higher resistance to solvents along with superior mechanical and weathering damage resistance. Industry players are focusing on introducing environmentally friendly polyurethane coatings for improving their market share. For instance, in 2018, PPG Industries Inc. launched its advanced coatings using isocyanate free polyurethane technology. Asia Pacific automotive paints and coatings market witness significant growth over the forecast timeframe. This can be attributed to the improving economic conditions, rising disposable income along with higher requirement for personal mobility solutions. The increasing presence of automotive manufacturers across the region along with setting up of production facilities for ramping up of vehicle production further expands the regional share over the study timeframe. For instance, in 2019 Tesla Inc. announced the setting up of its Gigafactory in China for producing Model 3 and Model Y vehicles. Few of the industry participants in the automotive paints and coatings market include Nippon Paint Holdings Co. Ltd, Covestro, Cabot Corp, Eastman, PPG industries Inc, Dupont, and BASF SE. Other notable players include Wanda Refinish, Axaltra Coating Systems, Donglai Coating Technology, KCC Corporation, Akzo Nobel NV, Clariant AG, and Valspar. Strategic joint ventures and partnerships among industry players are among the strategies adopted in the industry for expanding their market share. For instance, in February 2019, Nippon announced a strategic joint venture with Blue Bird Automotive to provide car paint job services in India.